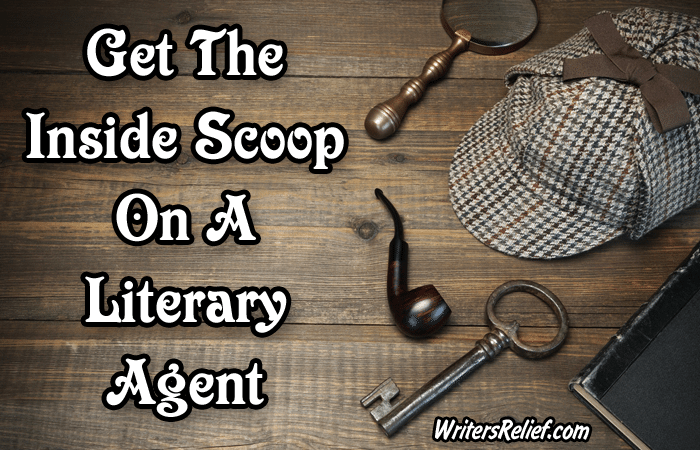 Get The Inside Scoop On A Literary Agent - Writer's Relief, Inc. When researching literary agencies, most writers choose which literary agents to query based on the brief descriptions available in books of market listings. But if a literary agent that you queried contacts you to request your complete manuscript or to make you an offer of representation—first, do your happy dance, because that doesn’t happen every day!—then, consider conducting a thorough investigation into your potential partner. The first thing you should do is visit the agent’s website. And during any discussions, you should ask the agent specific questions to get a better sense of how he or she operates (read more: Nine Questions To Ask A Literary Agent). But if you want to know about a literary agent’s reputation within the larger publishing community, you need to uncover the behind-the-scenes scoop. So put on your amateur sleuth deerstalker hat and let’s start digging up clues! Sign up for Publisher’s Marketplace. Publisher’s Marketplace is a website where literary agents, writers, and editors post information about successful book deals. The website is not free, but anyone can join. While not every literary agent will post a book deal on Publisher’s Marketplace, many literary agents and editors do check in regularly. You can do the same: Log in and search for news on your potential literary agent. Has the agent been active? For how long? And how recently? How many book deals has he or she done? Is he or she a new literary agent? Find more clues online. Many writers Google the name of their potential literary agent, skim the first page of results, and stop there. But you can often find more information about a literary agent when you check the second, third, and fourth pages of your search engine results. You may find other writers talking about your potential agent in a chat room or forum. You may discover blog interviews or commentaries. You might also uncover interviews with writers who are represented by your potential literary agency. Every little bit of information helps when you are trying to decide whether or not a literary agent is right for you. Visit Predators & Editors. Predators & Editors is a central hub where writers can share complaints or grievances about publishing industry professionals (you can also search for jobs, contests, etc.). Check to see if there are any complaints against your potential literary agent. Ask around. If you are involved in a writing group or association, ask the other members what they know about your potential literary agent. But remember: If the writer you are talking to does not have direct experience with the literary agent in question and is simply repeating what he or she has heard, take the information with a grain of salt. In a best-case scenario, you will be able to connect with another writer who has worked directly with the literary agent in question. But if you’re hearing whispers from many different writers saying your potential agent is not on the up-and-up, you could be right to heed the warnings. Go to a writing conference. Many literary agents make appearances at writing conferences. Find out where your potential literary agent will be speaking or appearing and make plans to attend. If your potential literary agent is speaking at a well-known and reputable writing conference, he or she is probably respected and above board. Here’s where you can find a great list of writing conferences. Talking to one writer or visiting one website will not give you enough information to accurately evaluate your potential future literary agent. You could meet one writer who has had a fabulous experience with your agent, or another who describes the partnership as “so-so.” Your best bet is to gather as much information as you can from multiple sources—only then will you be ready to make one of the most important decisions of your life! Not sure that your potential agent is your top choice? Read more: When Is A Good Agent Good Enough? QUESTION: Which of the above suggestions have you used to find out more information about a literary agent? Pred-ed tries to give good advice, but much of what they list is inaccurate or outdated. Until recently, they listed Hachette as a literary agency. Many of their listings say “not recommended,” without saying why.